A Taiwanese girl sustained serious but not life threatening injuries in an encounter with a bison in the Old Faithful area on Friday, May 16th. Shortly after noon, the 16-year-old exchange student was visiting Upper Geyser Basin with her host family. While hiking near Old Faithful Geyser, the family joined a group of people watching a bison grazing adjacent to the trail. According to firsthand reports, the group was somewhere between three and six feet from the bison. The girl turned her back to the bison to have her picture taken when the bison lifted its head, took a couple steps and gored her. When responding rangers arrived on scene, there was a group of people fewer than ten feet from the grazing bison. The rangers, with assistance from bystanders, moved the girl a safe distance from the bison. The girl was transported to the Old Faithful Clinic, treated and then flown to a hospital by helicopter ambulance for further medical treatment. On Saturday, May 9th, rangers received a report that a white pickup truck had been parked for several days at Saline Valley Dunes, a remote area only accessible to 4×4 vehicles. Rangers searched the area on Sunday but were unable to locate anyone associated with the truck. Through investigation, they determined that it had been rented by a single person and had not been returned by the rental contract’s termination date. On Monday, the Beverly Hills Police Department checked at the man’s home and confirmed that he was overdue and a search was begun. 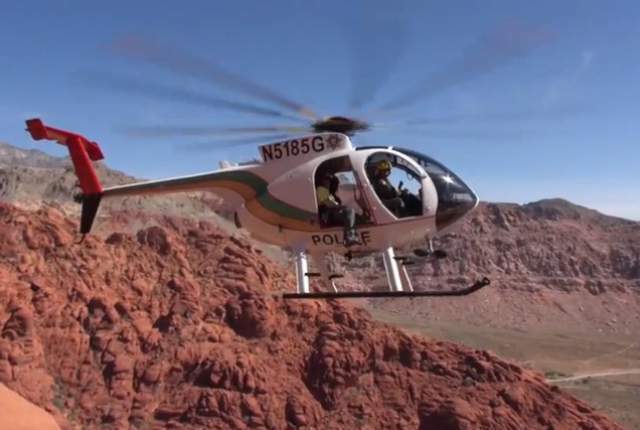 Rangers were joined by Inyo County SAR, China Lake Mountain Rescue, and California Highway Patrol’s helicopter H80. On Tuesday morning, H80 was re-tasked to another SAR which was occurring simultaneously at Mesquite Sand Dunes. Once H80 cleared Mesquite Sand Dunes, the crew returned to assist in the Saline Valley search efforts. San Bernadino, Tehachapi, California Rescue Dog Association, and Kern Valley SAR groups also joined the search. Around 10 a.m., H80 located the missing man, who was roughly five miles from his vehicle and to the east of the dune complex. The man reportedly set out alone for a day hike on the morning of Tuesday, May 5th, and became disoriented. Unable to find his way back to his vehicle, he followed a group of burros to a watering hole where he subsisted until rescue arrived. The man was transported to Northern Inyo Hospital where he is being treated for second degree sunburn and a rhabdomyolysis. A team of rangers, emergency medical personnel, Teton County SAR team members and a contract helicopter quickly swung into action Sunday morning to rescue four backcountry ski mountaineers who were involved in an avalanche on the northeast face of Mount Moran. Teton Interagency Dispatch Center received a 911 transfer call from Teton County at 9:30 a.m. on Sunday and quickly contacted park rangers, who immediately began a coordinated rescue operation. Because of the remote location on Mount Moran and the report of multiple injured persons, rangers quickly staged at and responded from the Jenny Lake Rescue Cache, located at Lupine Meadows near the base of Teewinot Mountain. Rangers also summoned the Teton County SAR contract helicopter. The Teton County SAR helicopter subsequently returned to pick up the two other avalanche survivors and transport them out of the backcountry. Additional flights were made to bring out Lynch’s body, as well as the remaining park rangers and their rescue gear. 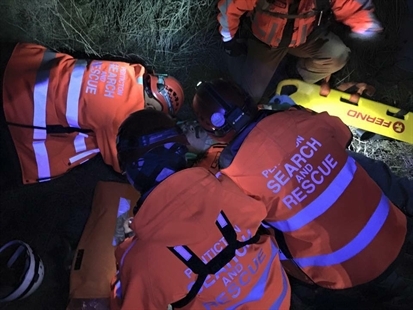 All rescue personnel were safely out of the mountains by 3 p.m.
On the morning of May 13th, rangers received a report of a woman stuck on a cliff face near the Damnation Creek Trail. Rangers responded to the woman’s location and found that she was approximately 150 feet up a 250-foot cliff above the Pacific Ocean. The woman had climbed the cliff face to escape being trapped by the rising tide. It was determined that a technical rescue would result in a high level of risk to involved personnel, so the United States Coast Guard was contacted and performed a hoist operation, removing the woman from her perch. The National Park Service managed the incident with assistance from California State Parks, Del Norte County Search and Rescue, CAL FIRE, and the USCG. The body of an Argentinian solo climber was discovered at the 17,200-foot high camp of Mount McKinley just before midnight on Sunday, May 10th. Heraldo Javier Callupan, 39, of General Roca, Argentina, appears to have died of unknown medical issues. Callupan began his ascent of the West Buttress route on May 1st. According to other climbing parties at the 14,200-foot camp, he headed up to the 17,200-foot high camp on May 6th. No other parties were camped at 17,200 feet between May 6th and May 10th, the date when the climber’s remains were found by a two-person team upon their arrival at high camp. Callupan was found lying in the snow in the middle of the camp plateau with no visible signs of trauma. That night, the reporting team used FRS radio to report the event to pararescuemen from the Alaska Air National Guard’s 212th Rescue Squadron who were camped at 14,200 feet. The pararescuemen then relayed the discovery to NPS mountaineering rangers in Talkeetna via satellite phone. Due to delays in direct communication with the original reporting team, and with no NPS ranger staff positioned at the 17,200-foot high camp this early in the season, it took several days to make a positive determination of the man’s identity. NPS staff worked with the Argentine consulate to notify Callupan’s next of kin on Wednesday, May 13th. Callupan’s remains will be recovered from the 17,200-foot camp when NPS mountaineering rangers are safely acclimatized for the recovery effort and when weather conditions allow. The remains will then be transferred to the State of Alaska medical examiner. Two climbers from Idaho were rescued from 7,500 feet on Mount Dickey after triggering a slab avalanche the evening of Monday, May 12th. Luckily, Saxon Spellman, 27, and Michael Wachs, 24, were not caught in the slide and were not injured. The two men attempted to self-evacuate from the mountain, but found no safe exit routes. The stranded climbers were observed by an air taxi pilot waving their arms above an ‘SOS’ stomped out in the snow on the west shoulder of Mount Dickey. Once NPS ranger staff was notified of the distress call, Denali’s high altitude A-Star B3e helicopter and two mountaineering rangers flew to Ruth Gorge. Rangers made a positive identification of the two climbers, who had just activated their SPOT device. Pilot Andy Hermansky was able to land the helicopter on a flat section of the peak and evacuated Spellman and Wachs without further incident. Mount Dickey is a 9,545-foot technical peak located in Denali National Park and Preserve’s Ruth Gorge area. No other climbers besides Spellman and Wachs were observed climbing Mount Dickey that day. Following several new feet of snow coupled with windy conditions in the Alaska Range, NPS rangers have observed widespread avalanche activity in the Ruth and Kahiltna Glacier areas. Following the one near miss on Mount Dickey which took place several days after the storm, the avalanche conditions appear to be lingering. The conditions are widespread, occurring on many aspects of the peaks and spanning a broad range of elevations. Climbers have been advised to exercise caution due to the persistent nature of the avalanche hazard. For ongoing condition reports, climbers are directed to http://www.nps.gov/dena/mountainblog.htm. This entry was posted in Search and Rescue, Survival Weekly and tagged backpacking, bear hunting, camping, dirtbike, kayaking, rock climbing, search and rescue, Search and rescue stories, wilderness emergency, wilderness medicine, wilderness survival, wilderness survival stories on May 19, 2015 by bigpigoutdoors.